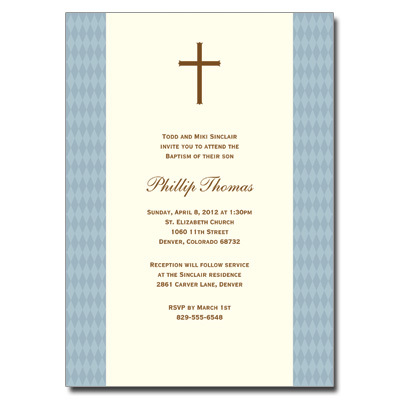 Celebrate your son's Baptism or Christening with this elegant invitation. A classic cross is featured at the top, printed in brown ink to match your personalized text. Printed on ecru stock, a blue diamond pattern creates a left and right border giving this card the perfect finishing touch. Comes with matching ecru envelopes. Card measures 5x7.